Gallery owner and artist Kay West hopes the presence of Little Dog helps boost the local arts scene. When the Garland District's longtime fine arts space the Tinman Gallery closed two years ago due to its owner's retirement, neighbors wondered when or if something else would come along to fill the role of a designated arts gallery. Earlier this year, someone did, as Spokane transplant and artist Kay West debuted the cozy Little Dog Art Gallery in a narrow retail space sandwiched between the Rocket Bakery and Groove Merchants record shop. "It seemed like the arts scene needed more legitimate galleries, and I figured I was just going to open one," West reflects from the tiny, 300-square-foot space. All available wall space around her is filled with dozens of original pieces in every color and style imaginable. Opening in May, Little Dog has since hosted several monthly, themed art shows featuring the work of dozens of artists from across the region who work in all art disciplines. The current show running through August, "Exquisite Woman," displays pieces celebrating the female subject, by a collection of mostly women artists. The show's name comes from the Edgar Allan Poe quote: "There is no exquisite beauty... without some strangeness in proportion." Participating artists include Katie Mandley, Kim Long, Linnea Tobias, Christina Rothe and Elsie Stewart. West relocated to Spokane from Southern California five years ago and jumped right into the local arts scene. She's shown her work — mostly photography — at various venues around town that weren't designated art galleries, which partly spurred her to launch Little Dog. "There was a real need for a gallery where artists could display their work and bring their clientele to discuss it," she says. West brings gallery experience with her, having managed an artist co-op back in California. Here, her sister, Melba Slater, is partnering with West to run the gallery, but she oversees all its operations. By design, she doesn't plan to display much, if any, of her own work at Little Dog. "I want it to get on a solid footing as a fine arts gallery, not my gallery, and known as a place where people who live here or visitors could come and see quality artwork," she explains. 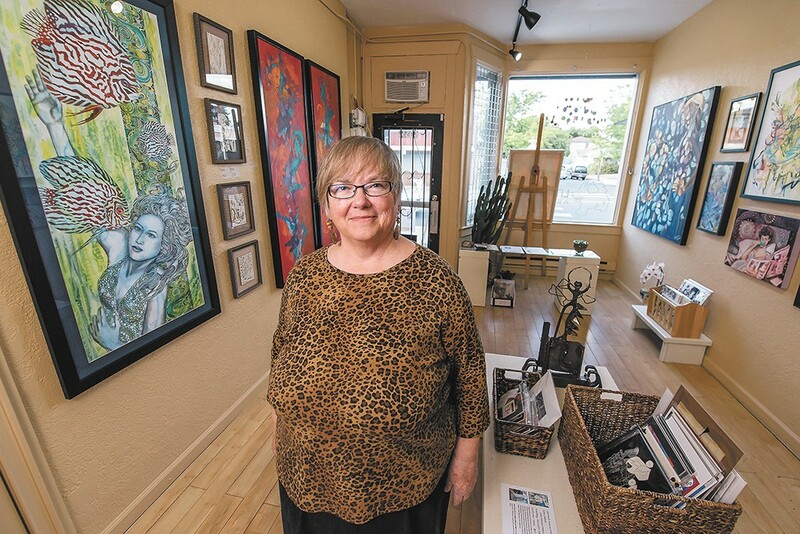 Over the past five years since moving to Spokane, West says she's observed some noticeable changes in people's mindsets when it comes to supporting the arts; another reason she felt driven to open the gallery. "More people are coming here from Seattle, Portland and outside the area, and I think they're bringing with them expectations for the area and arts in all its forms. I think there is a need to meet that expectation," she says. Over that same period, West says she's also been impressed by how the local arts community has united to help establish and define Spokane's arts identity, and make it a place where professional artists can succeed in their creative endeavors. At the same time, West sees lots of ground to be made up when it comes to community arts education. She hopes that with Little Dog she can help contribute to that. "Obviously a gallery has to sell pieces to keep their doors open, however, I think that of equal importance is community education, and that families can come in here with their children and look at art and have a positive gallery experience," she says. Coming up at Little Dog, West plans to host more "Second Saturday" show reception events since the gallery is not in the downtown core, where First Friday's arts event is focused. For September's show, "Earth + Above," the art theme reflects the interactions of landmasses with the sky. Later this fall, October's guest-curated show follows the theme "Origins of Fear."